The prototype was re-engined with a Alfa Romeo 115 engine as the FN.305A which then entered production by Piaggio as the Nardi works were not large enough. 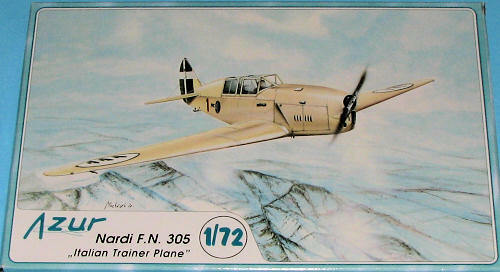 The Italian Air Force had ordered 258 aircraft most of them two-seat FN.305A fighter trainers and liaison aircraft, a few of the aircraft were completed as single-seat open-cockpit FN.305Cs and enclosed-cockpit FN.305Ds. Following the Italian order in 1938 nine aircraft were sold to Chile and 31 to Romania. Romania then built 124 aircraft under license by IAR. The largest export order came from France but only 41 had been delivered when Italy declared war on France in June 1940. The final export customer was Hungary who ordered 50. If you are used to MPM/Special Hobby/Azur kits, then this one is no real departure from most of them. There is one sprue that holds the vast majority of the aircraft. A trainer doesn't have a ton of parts and this one surely follows in that vein. A small photo etch fret includes two instrument panels, some control actuators and a few other bits. There is an acetate panel to go along with the instrument panels. Resin is limited to two seats and the nose section. Two nicely done vacuformed canopies complete the basic parts list. Interior detail is limited to a floor, two control sticks and the aforementioned seats. There are plastic backings for the etched instrument panels and some sidewall detail is also provided. This is trapped between the two fuselage halves and a small forward instrument panel hood is added. The lower wing includes the forward lower fuselage section with some featureless wheel wells glued in place prior to assembly. Upper wings are best attached after the lower wing to help eliminate any root problems. Landing gear is of the open variety and some of the photo etch is consumed building them up. A tail skid is provided. The two blade prop is glued to the resin forward nose piece. Markings are for three planes. One a French version in overall aluminum dope with standard roundels and rudder stripes. The next two are Italian. One is the cream colored box art plane from 23 Gruppo and the other is a sand brown over light grey aircraft that has a lot of brown mottles and huge white bands around the fuselage and wings. Decals are very nicely done and look to be of good quality. OK, not a ton of parts, and as such, would be an excellent choice for someone just getting into short run kits. It has resin, photo etch and vacuformed bits, all pretty much staples of the genre. And it is an interesting aircraft that one doesn't normally see modeled.